← Making friends as an adult. 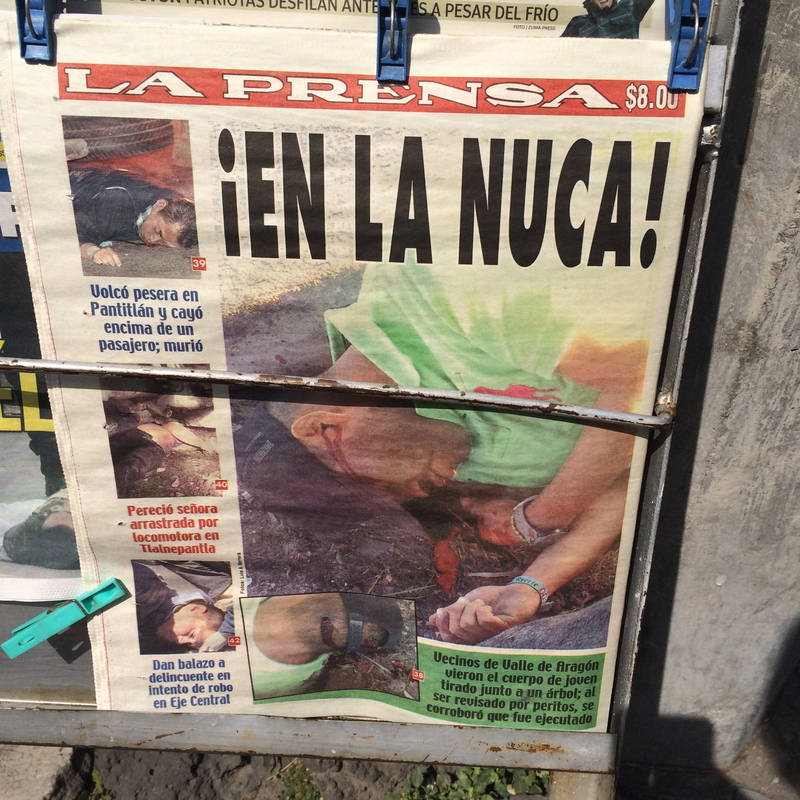 Yesterday I was walking past a news stand in Mexico City. The type that has the front covers of the days newspapers out on show for you to peruse as you pass by. One headline was about a man that had been hit by a train in a town a few hours out of the city. Below it was a photo. Not just of a stopped train, or perhaps some blood on a track, but of the actual man, some limbs missing, his face visible and he was most definitely dead. Today I saw a similar image on the front of the paper. But this time it was a body that was found tied to a tree and he was thought to have been executed. This is a normal occurrence in Mexico. Graphic images showing badly injured corpses on the front page of the paper. Images that would most definitely be banned in my home country Australia, as well as many other countries around the world. After a year of seeing them, I am not desensitised. I still find it both disturbing and immensely disrespectful to the family and friends of the deceased person. But on the other hand it is reality. People do die every day and in horrible ways. When we censor the media with the aim of protecting the public from the disturbance of seeing something uncomfortable or respecting the privacy of the individuals involved, we are also providing a censored portrayal of reality. Not that either is right or wrong, but just perhaps they are both as unethical as the other. The way that death is uncensored in the media is just one example of how death is much more a part of life here in Mexico. Kids are brought up celebrating the lives of their past ancestors on the annual Day of the Dead at the start of November. Skulls and skeletons are a modern and historical part of art and society. They are not something to be feared, or to have nightmares about when you finally get your own bedroom after sharing for years with your siblings. Skeletons are not something that are only associated with cobwebs and spiders on halloween to scare children about the possibility of ghosts and death. They are a daily reminder of the importance that family and ancestors hold in Mexican culture and an example of the influence Mexican artists, like José Guadalupe Posada and Frida Kahlo, have had on modern Mexican society. 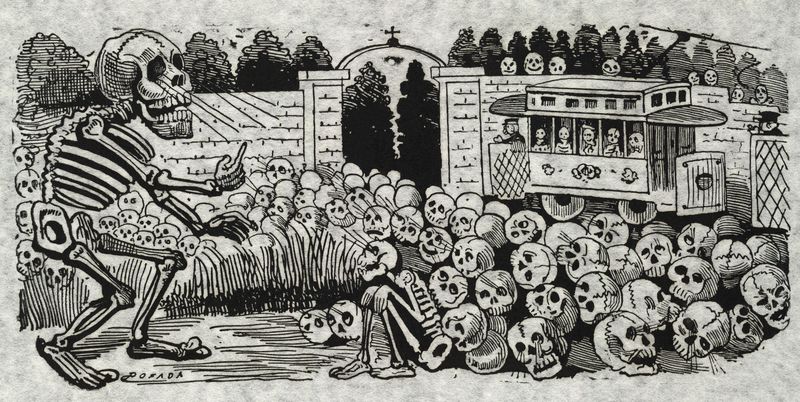 ‘Gran calavera eléctrica’ (Grand electric skull) by José Guadalupe Posada, 1900-1913. When we first arrived in Mexico, I did not understand the common presence of skulls in households, shops, restaurants and street art. It made me feel uneasy, it made me think about people dying and it definitely did not make me want to buy a skull and put it next to a vase of fresh flowers in the hallway. But along with seeing the graphic images on the paper every day, and the cultural education I have received this past year around the Day of the Dead celebration, my attitude has changed. When we return home to Australia we will be doing so with a brightly painted Mexican scull and artwork that does have some skeletons on it. When I look at it, I now think about Mexican art, history, past family members and the celebration of life. I will be relieved to have censorship working to prevent my daily discomfort of seeing shocking images on the front page of the paper, but at the same time I will miss the harsh reality that does actually exist. There is a vibrant sense of life and death in Mexico that is difficult to find elsewhere.